The Derby Panthers scored in all three phases of the game in its 49-13 district win over Haysville Campus. Brady Rust rushed for two touchdowns to lead the Derby offense, while Darreon Jackson returned a punt 55 yards for a touchdown and returned a kick 80 yards for a second special teams touchdown. Jacob Moeder scored on the defensive side with an 8-yard interception return for a touchdown. Wichita Northwest controlled the line of scrimmage on both sides of the ball on their way to a 61-14 beat down of Dodge City. The Grizzlies dropped eight back in coverage against the pass happy Red Demons all night due to the dominant play of defensive linemen Andrews Ronquillo, Branden Ho, and Duall Watson. Twelve of the 17 Dodge City runs went for a loss of yardage or no gain. Hutchinson scored 14 points in the first two quarters to take a 28-0 halftime lead before defeating Garden City 62-14 on Friday night. The Salthawks put up 21 more points in the third to break the game open and earn an opening win in district play. 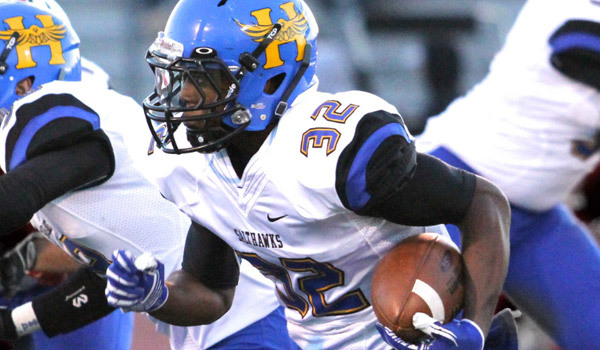 Blaik Middleton carried 10 times for 204 yards and four touchdowns for the Salthawks. Middleton also caught a 65-yard touchdown pass from Turner Wintz. Hutchinson will face Dodge City next week, while Garden City takes on Wichita Northwest. Kapaun Mt. Carmel shutout Emporia on Friday night, 21-0 for its fourth consecutive win. Alexander Norris rushed for 173 yards in the win. Despite not putting a single point on the board, the Spartans were able to gain 332 yards of total offense. Topeka Seaman blasted rival Topeka West 48-0 behind Reid Fehr’s three-touchdown performance. Fehr rushed for 103 yards in the win as well. The Vikings quarterback, Dalton Cowan was efficient from the pocket throwing for 214 yards, three touchdowns, on 10-of-13 passing. Bonner Springs earned its sixth straight victory with a 48-15 win over KC Turner to open up district play. The Braves held a 21-3 halftime lead and outscored the Golden Bears 27-12 in the second half in the win. Bonner Springs will face Mill Valley next Friday and KC Turner meets St. James Academy. Baldwin took advantage of a big first half and fought off a De Soto comeback to win its fifth straight game, 33-19. The Bulldogs’ Joel Katzer rushed for two touchdowns and senior wideout Darius Johnson caught a 33-yard touchdown pass to give Baldwin a comfortable 26-6 lead at the break. De Soto stormed back as Jason Johnson returned the opening kickoff of the second half 86-yards for a touchdown. Baldwin fumbled late in their own territory as De Soto cashed in on the short field to cut the deficit to 26-19. The comeback fell short however as Katzer scored his second rushing touchdown of the night. Fort Scott rushed for 205 yards and three scores in its 23-8 win over the Chanute Blue Comets on Friday night. The Tigers had five players rush for 25 yards or more in the win. Chase Brown led the rushing attack with 78 yards and one touchdown. Ulysses and Mulvane were tied four different times throughout their game, but it was Ulysses that had the last laugh after Ian Rudzik scored from 20-yards out with 2:29 left in the game to give the Tigers the 36-29 win. Rudzik rushed for 185 yards and three touchdowns in the win. McPherson handed Abilene its first loss of the season, 17-6. The Bullpups build a 10-0 lead on a field goal and a Kyler Kinnamon 15-yard touchdown run. Abilene would pull within 10-6 as Harley Hazlett tossed a touchdown pass to Zach Barberi. The Cowboys threatened before halftime, but were intercepted in the end zone. McPherson finished the scoring on a 38-yard run by Kinnamon in the fourth quarter. Drake Hake carried Concordia to a 28-18 win over Colby on Friday night. Hake’s stat line read; 26 carries, 334 yards, and three touchdowns including a late fourth quarter touchdown that broke open a tight 21-18 game into a double-digit win. Wamego improved to 6-1 on the season after a 20-6 win over Chapman to open district play. The Red Raiders were carried by quarterback Kyler Alderson who threw for 279 yards and two touchdowns, and rushed for 94-yards and another score. Alderson had 57 of his rushing yards on a quarterback scramble that put the game out of reach for the Irish. Pratt used their rushing attack to control the clock and build a 28-0 halftime lead en route to its 28-7 win over Hugoton. Senior Derek Barnard rushed for two touchdowns in the win. Senior Darrian Turner rushed for 215 yards and three touchdowns in Centralia’s 35-6 win over Nemaha Central. Turner showed off his speed on Friday night by having two of his three touchdowns go for 75 yards or more in the win. Hesston remained undefeated on the season after a 56-14 thumping of Hillsboro during the first week of district play. The Swathers saw themselves down 7-0, but then rattled off 56 unanswered points to earn the blowout victory. Hesston scored five times in the first quarter, highlighted by a span of three touchdowns in two minutes. Elias Jasso-Cardenas rushed for three touchdowns to lead Hutchinson Trinity to a 33-22 win over Garden Plain. Although, Garden Plain led 22-21 with 3:54 to play in the game, it was Jasso-Cardenas to the rescue after scoring from 28 yards out with 2:51 to play. David Thibault scored on a 32-yard run with just a minute to go. On Saturday, Sacred Heart exploded for 34 points in the second quarter in knocking off Medicine Lodge, 62-12. Sacred Heart quarterback Justin McCartney completed 7 of 9 passes for 124 yards and two touchdowns, while freshman quarterback Cole Elmore completed both of his passes for touchdowns. Thomas Williams had five receptions for 81 yards and a score as four different Knight receivers caught touchdown passes. Cedrick Sales rushed for 103 yards and a score on just seven carries. The Knights led 40-0 at halftime. Senior quarterback Nate Cearley passed for 123 yards and two scores as Sublette bested Stanton County, 24-13. Wyatt Brown carried 20 times for 181 yards and a score to lead the Larks. Brown also had two receptions for 83 yards and another score. Cearley also rushed for a score and picked off a pass on defense. Mission Valley held off Chase County 14-13 to claim a key district win and keep pace with Marion in District 3. The Vikings and Bulldogs played a scoreless first half before each team scored in the third quarter. Trailing in the fourth quarter, Chase County scored and failed to get the two-point conversion to give them the lead. The Bulldogs got the ensuing onside kick, but could not score. Dane Howe and Tanner Allen scored touchdowns for the Vikings and Willis Butler converted both PATs. Brendan Watts threw a touchdown pass and rushed for a score for Chase County. After leading 16-0 at halftime, Oberlin-Decatur Community scored 30 points in the third quarter to beat Quinter 46-0. The Red Devils got two rushing touchdowns from Troy Juenemann and one from Bryson Wesley. Wesley also returned a punt for a touchdown and Rex Diederich returned an interception 43 yards for another score. Quinter could muster only 34 rushing yards on 24 carries. Mankato-Rock Hills won a wild shootout over Lincoln, 86-64 on Friday night. The Grizzlies scored 38 points in the first quarter and led 60-36 at halftime. Senior Joel Broeckelman rushed 27 times for 325 yards and eight touchdowns to lead Rock Hills. Broeckelman also caught a 36-yard touchdown pass. Spencer Callaway completed all three of his passes for 74 yards and two touchdown, and added 95 yards rushing and a score. Zac Walter led Lincoln with 264 passing yards and five touchdowns. Walter also rushed for 207 yards and four more scores. Sedan outscored Oxford 41-14 in the second half of a 69-32 district win. Huntur Cummings rushed 22 times for 357 yards and seven touchdowns to lead the Blue Devils. Cummings also passed for 32 yards and a score and threw in 15 tackles on defense for good measure. Stafford remained unbeaten with a 78-52 win over Fairfield. The Trojans led 58-32 at halftime before the two teams each scored 20 points in the second half. Ethan Johnson rushed for 222 yards and two touchdown for the Trojans, while Jesus Herrera added 108 yards rushing and three scores. Quarterback Derek McClure passed for 125 yards and two touchdowns; both going to Austin Ceniti covering 66 yards. Cannon Burns led Fairfield with 43 carries for 338 yards and three scores. Burns also passed for 80 yards and had a 7-yard reception. Congratulations to Bucklin for stopping the state’s longest losing streak with a 56-6 win over Cunningham on Friday night. Isaiah Warnke rushed for 387 yards and eight touchdowns to lead the Red Aces to the win. The Red Aces ended a 54-game losing streak that dated back to September 26, 2008 when they defeated Greensburg, 34-28. Chase remained unbeaten with a 54-12 win over Centre-Lost Springs. The Kats outscored the Cougars 38-0 in the middle quarters to take control of what was an 8-6 game after one quarter. Chase moved to 3-0 with the win and will be heavily favored in their remaining two district games. Centre falls to 2-1 in district play and a playoff spot may come down to a Week 9 game at Sylvan-Lucas Unified.